The Windermere Way takes you on a scenic stroll through some of the most beautiful scenery in the Lake District. These series of walks around Windermere start in the delightful lakeside town of Ambleside and consist of four days walking (7-15 miles per day). Using the regular ferries to traverse the Lake, you get a chance to sit back and enjoy the outstanding views across the water as well as the fantastic walking. You will stay in the pretty town of Ambleside for two nights and then the bustling Bowness-on-Windermere for a further three nights, in carefully selected B&B's or guesthouses. Your luggage will be transferred for you between Ambleside and Bowness and you will be provided with detailed maps and route notes for your walk, as well as an emergency contact number should you need it. 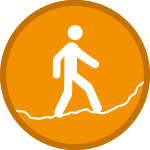 The walking will consist of a series of well maintained paths and trails as well as some sections of easy road walking. At times you will climb into the hills where you will be afforded magnificent views, at others you will follow the lake on gentle flat paths. This morning following breakfast, you will catch an early ferry from Ambleside to Bowness Bay and begin your walk back to Ambleside. You will follow the footpaths through bustling Windermere, before leaving the village and climbing up into the hills where you will be rewarded with breathtaking views of the Lake District from Orrest Head; famously described by Wainwright as the ‘introduction to a dream’. Today you have the option of taking a higher route up to Claife Heights, or following the route up to Loughrigg Fell where you will be greeted by a stunning lake panorama. This is followed by some gentle lakeside walking from Wray Castle. A short ferry ride this morning takes you back to Ferry House for the start of your walk to Lakeside. You will stroll along the lakeshore and through tranquil woodland on this gentle walk, with plenty of opportunity to see local wildlife and birds. Take the ferry back to Lakeside this morning, from where you begin a more challenging walk for your final day. You will begin with a steady ascent following forest paths to the summit of Gummer How, from where you have yet another magnificent 360 degree panorama of the Lake District. When the visibility is good, you can see the River Leven to the South, Coniston and the Langdales to the west, Helvellyn and Fairfield at the lake head and the Pennines to the East. Overnight: Bowness. £410.00 per person based on two people sharing. Accommodation in small hotels, B&B's and guest houses with en-suite facilities. Single supplement or extra nights: on request. 5 nights accommodation with full English breakfast Provision of map sections and route descriptions Luggage transfers Back-up service. Lunches, dinners, transport to/from, Windermere ferry. Any day April-October subject to accommodation availability Contact us to book this walk or make an enquiry. The closest airport would be Manchester, other options could be Glasgow, Birminggham or London airports. Reaching Ambleside is easy enough by train to Windermere, from where a frequent Lakeslink bus (555) runs to Ambleside. Alternatively a taxi from Windermere takes just 10 minutes to Ambleside. Many of the walks are easy and along the lake shore, however there are several climbs up to higher ground which can be more challenging. On the whole this is a gentle introduction to walking in the Lake District. We recommend that you take out appropriate holiday insurance covering you against illness, injury, and loss or damage to luggage. This insurance should also cover the possibility of your having to cancel your holiday for any reason. Contact us now to book this walk or make an enquiry.